Band of Gold is a variety band that performs all of your favorites from the 1940's to Today. Although weddings are our forte, Band of Gold is perfect for corporate events, birthday parties, festivals, and private party entertainment. BIOGRAPHY Since 1999, Band of Gold has entertained audiences in metro Atlanta and the entire Southeast with their wide variety of music from the 1940's to today. From DJs, soloists, and jazz trio to our full, 10 piece dance band, Band of Gold creates the perfect atmosphere for elegance and excitement making them one of the top bands in Atlanta for weddings, birthday parties, corporate events, private parties and festivals. Band of Gold recently won the Wedding Industry Experts Award for The Best Live Band In Georgia and The Knot's "Best Of Weddings" award. The band is also a 6 time recipient of WeddingWire.com's "Bride's Choice Award" placing them in the top 5% of wedding professionals in the country. Band of Gold's shows range from a cool jazz group capable of playing the perfect background music for meals or cocktails to a hot party band with horns, singers, dancers, and professional concert grade lighting. Their action packed shows are designed to pack dance floors with perfect song choices from their extensive catalog of music and their fun, energetic personalities. Band of Gold's quality, with it's incredible musicians, team members, and state of the art sound and lighting system, cannot be surpassed. And, Band of Gold has a 100% NO CHEESE GUARANTEE! Our team of professional musicians has been training for years for your event. Every musician in Band of Gold has more than 20 years of performing experience and Band of Gold has had the same team of players since 2008. Our musicians respect each other, the Band of Gold brand, and most importantly, our clients who trust us to deliver a top quality show every time. 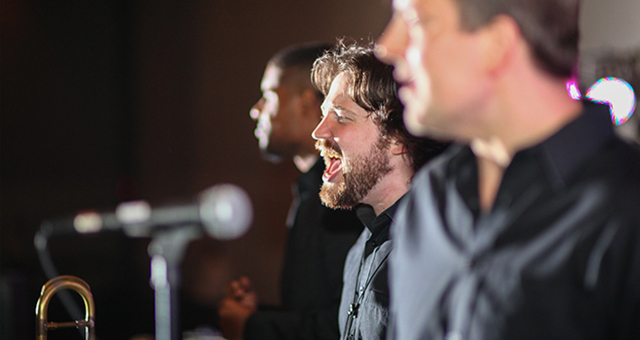 We are constantly rehearsing to bring a top notch, high quality musical experience to our clients and their guests. Dancing and FUN were huge priorities for our wedding, and Band of Gold had the dance floor rocking the ENTIRE night. We had 80yr old grandparents having a blast and some surprise performances from my now-brother-in-law! When our reception ended, people didn't want to leave. 2 attendees (college age) even reported that it was the most fun they'd had in their entire lives -- incredible! Band of Gold customizes the music to your likes. It's YOUR event. We want to get to know you and we want the music to be a personal reflection of you and your family and friends. Our play list extends from the 1940's to today and includes over 350 songs! But that's not all. We will gladly learn your most important songs. Our DJ can also play original recordings if a song is out of the band's reach or if you want the original version. Our goal is always to serve our clients' needs and to pack the dance floor. We work well with or without a coordinator to make your event run smoothly and to make your planning hassle free. Check out our extensive playlist! Corporate events, parties, festivals. We do it all! Are you looking for a specialty cover band to perform for your event? Band of Gold can perform hours of music from any decade or genre with or without costumes! From our Disco show to our History of Pop Music show, this band is all you need for your one of a kind party!